We use a lot of ingredients and we’re proud of that. We’re proud because we spent 10 years finding the best organic ingredients, and every one of those serves a unique purpose! You won’t find any chemicals in Organic Island. We don’t dilute our products with water and we definitely don’t use artificial fillers. Just all natural, all powerful ingredients. That’s why our products work. Some of these ingredients may already be familiar and others may be new to you. Here we explain the benefits of just some of our favourite natural ingredients and what makes them perform so brilliantly. What is it? It’s a natural preservative. It can also be referred to as AMS Leucidal Liquid. How is it powerful? It binds our natural formulas together and protects our formulations from bad bacteria. It’s an all natural alternative to harmful parabens, chemicals and other preservatives. Which products feature Radish Root Ferment Filtrate? Nearly all of our Organic Island products! We often get asked how we preserve our products without the use of traditional chemical preservatives – this is the answer! What is it? NOP Organic Dehydrasome Pumpkin Papaya. It’s an incredible blend of vegetable and fruit extracts, packed with anti-inflammatory phytochemicals. How is it powerful? Rich in enzymes, Dehydrasome Pumpkin Papaya naturally softens the skin and enhances cell renewal without the irritation and reddening sometimes bought on by the use of acid peels. This blend is also rich in anti-inflammatory phytochemicals and natural antioxidants that further enhance the healthy appearance of your skin. Which products feature Dehydrasome Pumpkin Papaya? Our Paw Paw Lip Salve. What is it? Oil from the outer peel of the orange fruit. How is it powerful? Orange Sweet Oil is an essential oil that has both antiseptic and anti-inflammatory properties. It also increases collagen production and blood flow to reduce signs of ageing. Which products contain Sweet Orange Oil? What is it? Aloe Vera juice, extracted from the leaves of the Aloe plant, used for centuries to soothe skin. How is it powerful? Anti-inflammatory, deeply hydrating and best of all, healing. Which products feature Aloe Barbadensis Leaf Extract? Nearly all of our all natural Organic Island products! Aloe is a great based for organic formulations that don’t use water because it’s gentle and suitable for all skin types. What is it? An extract from the leaves of the Olive tree. How is it powerful? Packed full of antioxidants, antibacterial and anti-inflammatory properties, Olive Leaf provides intensive hydration and anti-aging benefits. It conditions and softens your skin, leaving you with a soft, supple complexion and less fine lines. Which products feature Olive Leaf? What is it? An extract from the leaves of the tea plant – Camellia Sinensis. How is it powerful? Long praised for its general health benefits, Green Tea Extract is also great for your skin as it provides antioxidant and anti-inflammatory effects and protects your skin against UVB damage. Which products feature Green Tea Extract? What is it? The Manihot Esculenta plant grows in warmer climates and is comprised of 85% starch. 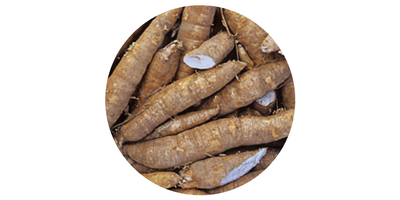 The Tapioca Starch is extracted from the roots of the plant. How is it powerful? It’s a beautiful, gentle ingredient that helps keep skin soft and supple, it’s soothing and it promotes the healing of sores. Which products feature Manihot Esculenta? Our Baby Nappy Rash Cream – A key ingredient to help soothe delicate skin! How is it powerful? A potent antioxidant, Lycii Berry also works as a skin-softening agent. Which products feature NOP Organic Lycii Berry? It is a key ingredient in our Nourishing Hand Crème to soften the skin and prevent the signs of aging! What is it? A flower from the Aster and Sunflower family that has been used for centuries to calm and soothe. How is it powerful? Mild and non-allergenic, Chamomile is perfect for sensitive skin. It is also an effective anti-inflammatory and antibacterial that soothes and cleans. Which products feature Organic Chamomile? All of our baby skincare products! It’s effective yet gentle on delicate skin! We hope you’ve enjoyed this explanation of some of our beautiful, powerful ingredients. If you’d like to ask us any questions about our formulations, please don’t hesitate to email us at info@organicisland.com.au and we’ll be more than happy to explain our products further.